Neither Garret Judd nor Lisa Rose wants a relationship. However, on dark stormy night, when the light went out in Okeechobee, Florida …. But this is a one-time thing they declare. Garret still functions in a somewhat state of limbo since the death of his wife ten months ago. He even leaves the care of their baby to the grandmother who already has more than enough to do managing the house at Circle P Ranch. Garret does his job as manager of Circle P on auto pilot, just getting through each day. The author Leigh Duncan tells a sweet story of family and friends support and love. She explores the inner thoughts of Garret and Lisa as they each struggle to get back to some kind of normal in their lives. The workings on the Circle P and Lisa’s involvement with entertaining the dudes during roundup time sets the stage for Garret and Lisa’s getting to know each other and becoming friends while saying no to the sexual awareness that crackles and pops like electricity when they are together. Baby LJ is a bright, shining little star in the story as he, like most normal babies, is on a mission to learn about his world, mindless of the havoc he can wreck in his zeal. Unbeknownst to him, he stirs up life-changing emotions in Garret and Lisa. 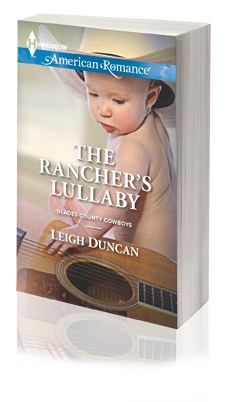 The Rancher’s Lullaby touches tender, sweet places in the heart that reaffirms the belief of love being able to overcome incredible obstacles, both physical and emotional, to arrive at a happy-ever-after.